National Comprehensive Cancer Network (NCCN). Hodgkin Lymphomas 1.2013. NCCN; 2013. Rahemtulla A, Terpos E. Hodgkin's lymphoma. Clin Evid (online) 2009; pii: 2404. National Comprehensive Cancer Network (NCCN). Non-Hodgkin's Lymphoma 1.2013. NCCN; 2012. Practice informed recommendation. London; 2013. Engert A, Eichenauer DA, Dreyling M. Hodgkin's lymphoma: ESMO Clinical Practice Guidelines for diagnosis, treatment and follow-up. Ann Oncol 2010; 21 Suppl 5: v168-v171. The Royal College of Physicians (RCP), The Royal College of Radiologists (RCR). Evidence-based indications for the use of PET-CT in the UK 2012. London: The Royal College of Physicians (RCP) and The Royal College of Radiologists (RCR); 2012. Clinical Knowledge Summaries (CKS). Neck lump. February 2010. New castle upon Tyne: CKS; 2010. Clinical Knowledge Summaries (CKS). Bruising. March 2010. New Castle upon Tyne: CKS; 2010. National Institute for Health and Care Excellence (NICE).Clinical guideline 156. Fertility: Assessment and treatment for people with fertility problems. London: NICE; 2013. British Committee for Standards in Haematology (BCSH). 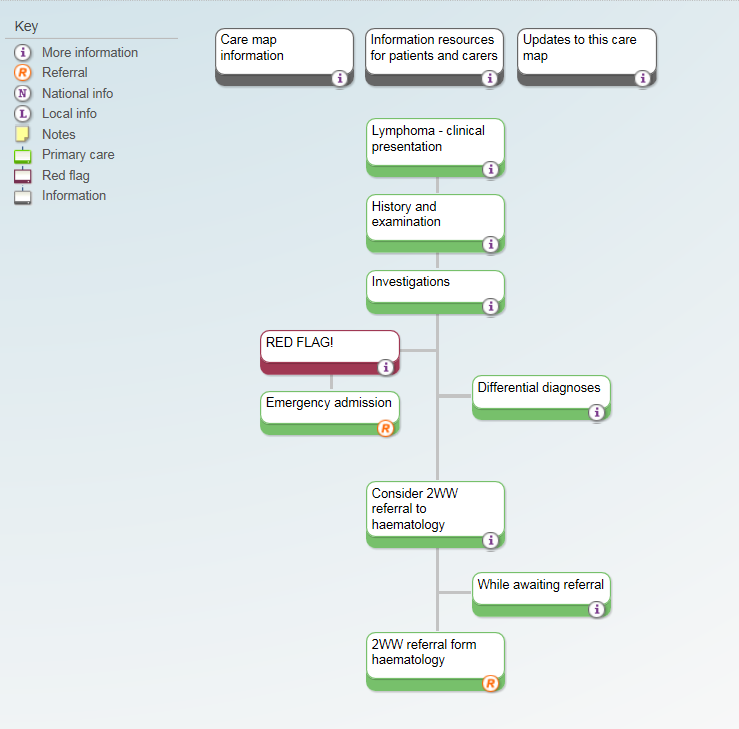 Best practice in lymphoma diagnosis and reporting. London: BSCH; 2010. British Committee for Standards in Haematology (BCSH). Guidelines on the investigation and management of Chronic Lymphocytic Leukaemia. London: BCSH; 2013. British Committee for Standards in Haematology (BCSH). Guidelines on the investigation and management of follicular lymphoma. London: BCSH; 2011. Willemze R, Dreyling M. Primary cutaneous lymphomas: ESMO Clinical Practice Guidelines for diagnosis, treatment and follow-up. Ann Oncol 2010; 21 Suppl 5: v177-v180. National Institute for Health and Care Excellence (NICE). Rituximab for the first-line treatment of stage III-IV follicular lymphoma. NICE technology appraisal guidance 243. London: NICE; 2012. Dreyling M, Ghielmini M, Marcus R et al. Newly diagnosed and relapsed follicular lymphoma: ESMO Clinical Practice Guidelines for diagnosis, treatment and follow-up. Ann Oncol 2011; 22 Suppl 6: vi59-vi63. British Committee for Standards in Haematology (BCSH). Guidelines for the investigation and management of mantle cell lymphoma. London: BCSH; 2012. Tilly H, Vitolo U, Walewski J et al. Diffuse large B-cell lymphoma (DLBCL): ESMO Clinical Practice Guidelines for diagnosis, treatment and follow-up. Ann Oncol 2012; 23 Suppl 7: vii78-vii82. British Committee for Standards in Haematology (BCSH). Guideline on the Management of Primary Resistant and Relapsed Classical Hodgkin Lymphoma. London: BCSH; 2013. British National Formulary (BNF). BNF September 2013. London: BMJ Group and RPS Publishing; 2013. Byrd JC, Furman RR, Coutre SE et al. Targeting BTK with ibrutinib in relapsed chronic lymphocytic leukemia. N Engl J Med 2013; 369: 32-42. Lopez-Olivo MA, Pratt G, Palla SL et al. Rasburicase in Tumor Lysis Syndrome of the Adult: A Systematic Review and Meta-analysis. Am J Kidney Dis 2013. Wang ML, Rule S, Martin P et al. Targeting BTK with ibrutinib in relapsed or refractory mantle-cell lymphoma. N Engl J Med 2013; 369: 507-16. National Institute for Health and Care Excellence (NICE). Referral guidelines for suspected cancer. London: NICE; 2005. National Institute for Health and Care Excellence (NICE). Guidance on cancer services: improving outcomes in haemato-oncology cancer - the manual. London: NICE; 2003. National Institute for Heal and Care Excellence (NICE). Referral guidelines for suspected cancer. London: NICE; 2005.